Robert Petersen was born in 1945 in the small farm town of Le Mars, Iowa and was raised there until 1952 when he moved with his family to Whittier, California. His education as an artist began in 1963 at Fullerton Community College where his interest in architectural drafting led him to develop a passion for drawing, painting, and printmaking. In 1966, he pursued his love for printmaking further at California State University, Long Beach under the former Tamarind Lithography Workshop printer, Robert Evermon. In 1969, Petersen went on to work as an assistant printer at Gemini G.E.L. where he printed editions for Frank Stella, Roy Lichtenstein, and Robert Rauschenberg. Most notably, Petersen served as one of the head printers for Rauschenberg's Stoned Moon series, during which the two formed a close friendship. 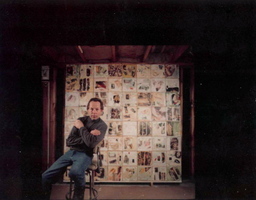 In late 1970, Rauschenberg invited Petersen to live and work with him on Captiva Island, Florida, which had recently become the artist's permanent residence and studio. In 1971, Rauschenberg and Petersen established the experimental print shop, Untitled Press, Inc., where they not only printed their own work but also for visiting artists including David Bradshaw, Brice Marden, Hisachika Takahashi, Cy Twombly, and Robert Whitman. Petersen lived and worked closely with Rauschenberg on Captiva Island until 1980. During the early 1970's Petersen predominately created monochromatic minimalist work and then began to explore the possibilities presented by his intricate sketch pages. In 1976, Petersen made his first monthly inspired journal drawing from the highlights of his sketchbook where he collected observations of daily surroundings, drawings for future work, musings, postcards, photographs, and ephemera such as calendar clippings and magazine illustrations. This technique continues to serve as the basis for his present work. In 1973, Petersen had his first solo show at Galerie Sonnabend in Paris, France, which was followed by numerous solo and group exhibitions worldwide. His work is represented in private and public collections internationally including the Centre Georges Pompidou, Musee National d'Art Moderne in Paris, France; The Metropolitan Museum of Art, New York, NY; Francois Pinault, Venice, Italy; Robert Rauschenberg Foundation, New York, NY; James Rosenquist, Aripeka, FL; Ileana & Michael Sonnabend, New York, NY; Cy Twombly Foundation, Rome, Italy, and Universal Limited Art Editions, NY. Petersen currently works in Tivoli, NY where he lives with his wife, Cinda Sparling, and daughter, Lena.